This Thai-run café is a greasy spoon that gives some of the adjacent Brixton Market eateries a run for their money. As the name suggests, duck eggs are the USP on the menu, served poached or any way you like; hen eggs are the alternative. 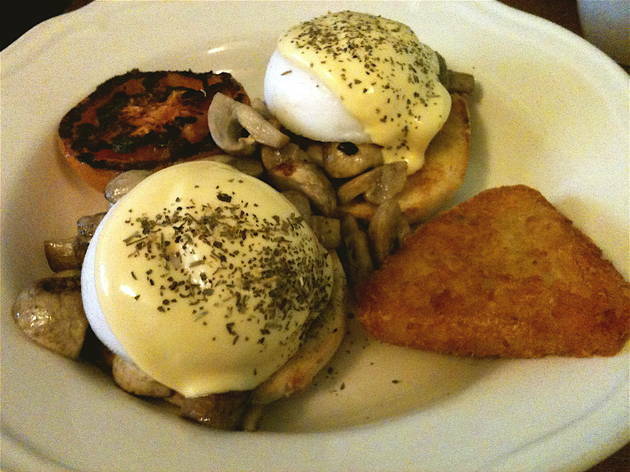 Our eggs forestiere was a play on eggs benedict, the eggs served over cultivated mushrooms over the muffins; these would have been better if the egg whites had been cooked through properly and the tomato more flavoursome, but the hash brown was crisp and decent. Coffee is from Illy, and the orange juice is from Innocent bottles. A little pricey for a caff in Brixton, perhaps, but this doesn’t deter queues from forming outside at peak brunch times. Probably my favourite place for brunch in the area, a really wide selection of dishes with big portions and friendly staff. My favourite is the eggs on ciabatta with halloumi and peppers. Since the cafe moved to the Prince of Wales pub they have a lot more space so you are pretty much guaranteed to get a seat, and you don't feel rushed to leave. I think I was in there for over 2 hours last time I had brunch there, plus they have prosecco on tap which always helps! Fantastic. There are two Duck Eggs. One in Brixton and the other in Dulwich. The Dulwich cafe has a rustic feel to it, with bohemian customers that are happy to queue for a seat at peak times. 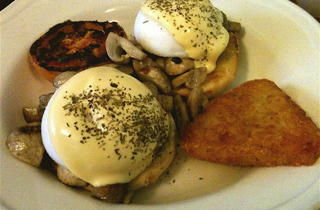 I enjoyed a mediterranean breakfast, (with duck eggs) whereas my partner tucked into duck eggs benedict. I must say it was certainly worth the wait and great value for money. No wonder there was a queue of people outside. Since the previous owner left it seems the quality went with her. Really disappointing food, specially for the price they charge and the poor service. Only had positive experiences of eating brunch (never early enough for breakfast) in this little café. I've had the standard and the vegetarian breakfasts, both excellent. Coffee is Illy, I found the staff to be perfectly polite, and didn't feel rushed. The best part is it's outside the Village, so there is a chance you can get a seat. Great little place, really friendly staff and better value than many others.... I read a couple of the reviews here and I am surprised, I've always found it to excellent and the staff to be super friendly. Definitely my favourite breakfast place in London! Good portions great price and amazing tasty duck eggs just the way you want them... Recommended!